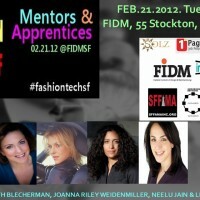 Tonight I am thrilled to be speaking at the FASHION+TECHSF Presents: Mentors & Apprentices event in San Francisco about social media branding. My fellow speakers are NEELU JAIN (Founder of Soulstice & Allergy Haven and Strategic Consultant for Grow Think & Madera Group), JOANNA RILEY WEIDENMILLER (CEO/Founder of The One Page Company & Partner of 360 Fashion Network ) and LILI BALFOUR ( Founder of Atelier Advisors). Moderators are OWEN GERONIMO (San Francisco Fashion And Merchants Alliance, Inc. & San Francisco Fashion Week ™ / CEO/FOUNDER) and BRAD CARRICK CEO of Solz Shoes. The event was at the San Francisco location of the FIDM/Fashion Institute of Design & Merchandising. Because there is a “fashion” focus to this event (a topic I enjoy discussing), I decided to take a look at some social media branding resources relevant for those in fashion and design careers (both of which have many aspects of technology). My advice to a student in fashion/design looking for work after they graduate (or someone changing careers) is to create an online brand for themselves. This “brand” should be focused on the professional niche related to your career goals. Building a professional brand means that you need to define what that brand is then translate that online. Forbes wrote an article titled “The First Step To Building Your Personal Brand” which covers many of the main branding points. In general, I suggest to build an online brand you need to: define your “professional” brand, setup your brand online, define and connect with other relevant brands/communities and then set up a daily social media schedule. Guy Kawaski’s book Enchantment is a great resource for tips on engaging with a social media community. A key part of building the brand will be investing in the right devices and resources such as a laptop, tablet, smartphone, digital camera, video camera, professional headshot/logo and “outsourced” training (web designer, video training) when needed. The first part of setting up your brand online is to create a landing page. Lifehacker posted with the “Best professional NamePlate Sites” including About.me, Flavors.me, Zerply, Re.vu. A good example of About.me is Owen Geronimo’s page. Two professional sites to look into are Intern Sushi (a great resource for finding Internships) and LinkedIn professional networking site. For LinkedIn, an example of a professional page is from one of co-speakers from the event Joanna Weidenmiller – CEO, The One Page Company. The One Page Company has great information on tools needed to create a 1 Page Job Proposal. Another fellow speaker, Lily Balfour – Founder of Atelier Advisors, also has a great LinkedIn page. Another alternative for setting up a landing page is to set up a blog or website. I self-hosted my about page on my blog TechMamas.com. Neelu Jain (a fellow panelists) also has a great landing page. An example of a fashion blogger that has an about page on her blog is Mira Torres of Beauty Bohemian. Twitter is a “micro blogging” social media platform to share whats going on at that moment (in 140 characters). Twitter is highly relevant because the information shared is very current. The community on Twitter is engaging and it is a great platform to reach out and gather a public following. My TechMama twitter feed is focused on the niche of curating content for family technology & social media and has let to accolades such as Time 140 Best Twitter Feeds, Working Mother.com List of Most Powerful Moms in Social Media and PCMag twitter top 100 ). Twitter also plays an important part with Fashion week including “live tweeting” fashion shows. SF Fashion Week also has a Twitter ID that is a must follow for anyone that follows fashion. The FIDM/Fashion Institute of Design & Merchandising main site and the Fashion Institute of Design & Merchandising’s Career Center are on Twitter to share current updates. Creating a Facebook page with your professional branding will allow you to interact with your community on Facebook. H&M, Zara and Burberry are good examples of fashion brands with interactive Facebook pages. Mari Smith has a Facebook page that focuses on her professional image of Facebook Marketing. Getting Gorgeous has a fashion focused Facebook page for the mom community. Ricki Lake is coming out with her new talk show next fall, but has already started a social TV community called “FriendsofRicki” which has a great Facebook page. The key to Facebook interaction to not only share your own content – but share other relevant content to your brand and interact with your Facebook community by asking questions or sharing thoughts that spark discussion. Video: YouTube & Livestream for creating a video and/or livestream presence: NYMag had a list of 50 Livestream and videos for last Spring’s New York Fashion Week. The San Francisco Fashion Week site shared across multi-media platforms. Google+: For social search purposes, create a “professional” Google+ presence to share content relevant to your brand. Owen Geronimo also has a good example of a Google+ page. Setting up a Google+ Page can also enable you to appear on Google+ related people and pages, one of the new parts of the Google social search features. Pinterest: Pinterest is one of the top sites for sharing visual content – especially those with a design focus. Mashable picked the ” 10 Most-Followed Users on Pinterest – one of which is a design student from Boston name Caitlin Cawley has over 790,000 followers. One local Pinterest example is SF Indie Fashion’s board. Another example is the Independent Fashion Bloggers boards. One of my main (TechMama) Pinterest board’s. focus is on Interesting tech I find each day to match with my “tech” niche. The Pinterest boards with the top following are design and crafts (including photos of handmade items in Etsy). Blogging on WordPress or other blogging platforms: Fashion Bloggers are making a big splash with their online fashion coverage which means starting a fashion blog can lead to big opportunities. Tumblr is a “micro” blogging platform that is used for shorter versions of blog posts. Whether you either work for a fashion company – or work for yourself – creating a blog is a great way to share your voice online and identify yourself as an influencer. A video by Coveted Media discusses the impact of Fashion Bloggers. There are many blogging communities to connect with, but a few such as Fashion Bloggers Connect, Independent Fashion Bloggers and BlogHer have communities of fashion bloggers. 360Fashion also has a blogger network of Fashion Professionals. One of the key features of a fashion blog is either beautiful digital pictures or high quality video that showcases the artistic and design skills of the blog author. Because of this focus on design, choosing a high quality digital photo or video camera (and getting training if needed) will be important to the success of a fashion blog. There are many other social media platforms if you have time! Please do share your favorites.